We adore many books by Dr. Seuss, don't you?! Back when Big Brother was four we took a week and completed many different kinds of learning inspired activities for several of his books. You can check out our week long fun with Dr. Seuss here! For Little Sis I decided to put together a craft and cutting Activity based on Thing 1 and Thing 2 in the book, The Cat in the Hat. 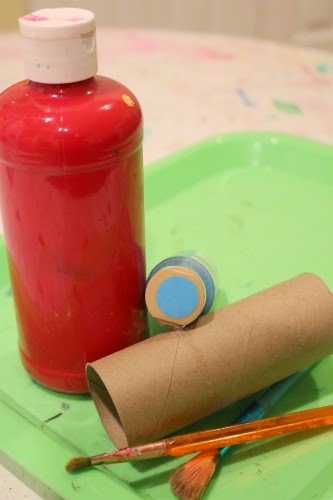 Once the materials are gathered, paint about 1/3 of the paper tube blue and the rest red. I ended up painting the tubes myself, but this could easily be set up for your child to complete. Let the blue and red dry for a bit and then paint a white circle near the bottom of the red half of the paper tube. Then write Thing 1 or Thing 2 in the white circle. To add some fine motor practice into this activity, give your child a pair of scissors for some cutting practice! In hindsight, I would suggest pre-drawing lines on the blue part of the tube to guide your child in his/her cutting skills. Or, just do as I did and hand over the scissors and encourage them to make some crazy hair by cutting vertical lines all around the blue portion of paper tube. Little Brother and Little Sis enjoyed this simple cutting activity. Great way to practice cutting skills and make a cute keepsake craft! 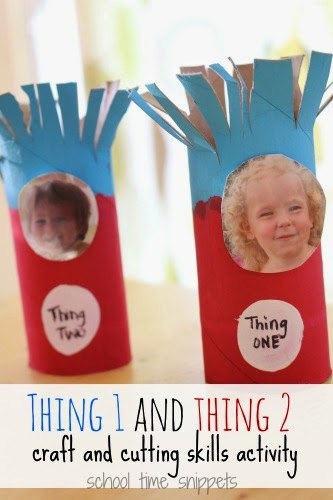 Finally, to personalize your Thing 1 and Thing 2 craft, tape a picture of your child's face onto the paper tube! Check out our 99 Fine Motor Ideas book! !